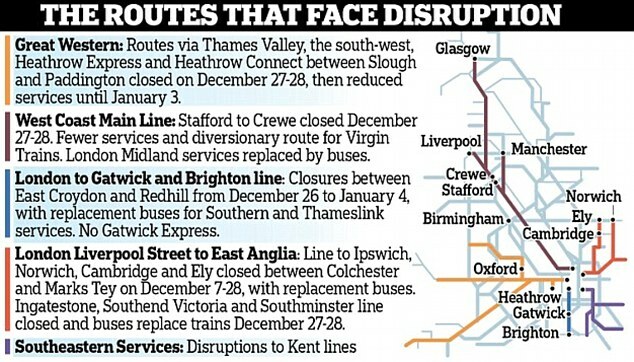 Rail passengers are facing travel chaos over the Christmas period as the largest ever programme of engineering works closes train lines for up to two weeks and cuts links to Heathrow and Gatwick. Millions of travellers trying to get home for the festive period or to major airports to jet off for some winter sun face a raft of cancellations and diverted routes causing delays and doubled journey times. Engineering works will block the main line from London to Gatwick for ten days, with the last Gatwick Express of the year leaving Victoria at 9.15pm on Christmas Eve and not restarting until January 4. There will also be rail closures to Heathrow for four days from Christmas Day due to Crossrail works, meaning neither Heathrow Express nor Heathrow Connect trains will run from London Paddington. Half the usual number of trains to Heathrow are set to run between December 29 and January 2. At Gatwick, more than half a million passengers alone are thought to be disrupted by the works – with trains terminating at Purley in South London instead of continuing their usual route. The £150million redevelopment programme on Great Western, Greater Anglia, Southeastern and the Brighton mainline is also expected to lead to station closures, delays and overcrowding. Journey disruption is also expected for travellers who had planned to head to Wales and the South West during the Christmas period. On the Great Western mainline, Paddington Station will be closed on December 27 and 28, forcing people to find alternative routes from Marylebone which go via Banbury and Oxford adding up to one hour and 30 minutes to the trip. 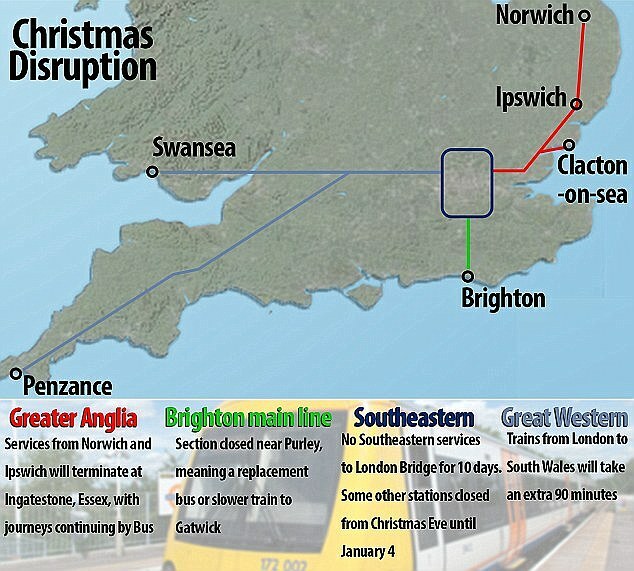 Those heading to Somerset, Devon and Cornwall will also have their travel plans scuppered on December 27 and 28. They will have to travel from London Waterloo with trains diverting to Basingstoke and Reading adding one hour and 20 minutes to their journey. Travellers in the east also face lengthy delays because, for the entire festive season from Christmas Eve to January 4, London Bridge station, Waterloo East, Charing Cross and Cannon Street stations will all be closed to Southeastern services. The reduced services from Kent and East Sussex will end in Victoria, Blackfriars and New Cross stations instead. Train links between Ipswich, Norwich and London Liverpool Street will also be closed for five days with services stopping at Ingatestone, Essex, and passengers offered a bus replacement service. Services in Lincolnshire will also be severely disrupted with the north-east of the county cut off from the rest of the rail network for over a fortnight. Stephen Joseph, director of the Campaign for Better Transport, said the large number of engineering works over the festive period had highlighted a 'lack of surface transport options' to London's airports. He said: 'These engineering works will of course cause huge problems for travellers and I suspect the decision has been taken to inconvenience airline passengers, rather than inconvenience commuters. Teresa Pearce, Labour MP for Erith and Thamesmead, warned that the engineering works could cause 'bedlam'. She said: 'Stations will be blockaded and shut. They are not explaining to people that services will cease from Charing Cross and Cannon Street at about 8pm on Christmas Eve. The improvements which include building new tracks, lengthening platforms for longer trains and upgrading signalling across the networks are part of a plan 'aimed at meeting surging demand and improving and expanding our railway network,' said Network Rail. Network Rail bosses are under pressure to finish rail engineering works on time to avoid a repeat of the Christmas travel chaos fiasco in north London last year. That saw thousands of passengers stuck at Finsbury Park on December 27 after work at King's Cross and at Paddington stations overran. There is also disruption expected on the Caledonian Sleeper rail service in the run-up to Christmas after workers voted to go on strike. Members of the Rail, Maritime and Transport (RMT) union backed walkouts and other forms of industrial action by nine to one over claims of defects on trains. The union has accused operator Serco of failing to fix faults on the service between Scotland and London. RMT has claimed the strikes will most likely take place in the days leading up to Christmas, which could leave many travellers struggling to rearrange plans for the holidays. RMT general secretary Mick Cash said: 'The poor service to passengers, in conjunction with the company's failure to address the issues, left us with no option but to ballot for industrial action. The union claimed there were more than 200 defects on trains - including smoke detectors disconnected, toilets being inoperable, and lighting and heating systems not working. Peter Strachan, managing director of the Caledonian Sleeper, said: 'While we are disappointed that the RMT has voted in favour of industrial action and action short of a strike, we have not yet received notification from the RMT of their intention.